Turnovers mounted on the Seward County Saints Wednesday night in Scott Auditorium in downtown Ark City. The Saints committed 17 first half turnovers on the way to a 26 turnover night and a 79-63 loss at Cowley. Seward actually outscored the Tigers 39-31 in the second half. But Cowley led 48-24 at the half. The Saints shot well at 50 percent and were only out rebounded by four. However, the Tigers had 18 more shots than Seward and the Saints were a woeful 11-23 at the foul line. Seward trailed by as many as 26 (52-26) before the Saints rallied by could not make the game close enough. Charles Beauregard scored 16 in the loss. 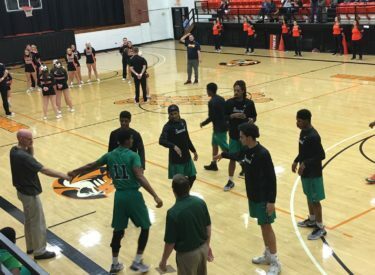 Seward had won seven consecutive games and nine of the past 10 against Cowley. Seward falls to 4-6 overall and 1-5 in the Jayhawk while Cowley is 6-4 and 3-3. Cowley is 6-0 in Scott Auditorium. Seward hosts Coffeyville Saturday night at 8 in the Green House on 107.5 and kscbnews.net. Flooring America and Holiday Inn Express at the buyout sponsors.